Elvis Enthusiasts Unite: A short Gillian Welch review, Salt Lake City chapter. A short Gillian Welch review, Salt Lake City chapter. 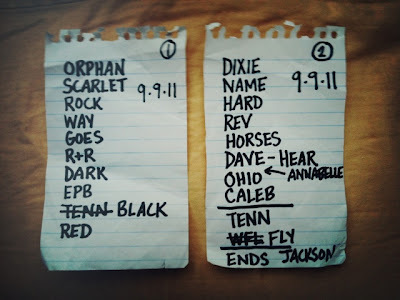 Gillian Welch Salt Lake City set list (Sept. '11). Life's slowed long enough for me to let everyone with ears to hear and eyes to see know this: the Gillian Welch show in Salt Lake City last weekend was all kinds of worth it. I'm pretty glad I bought two tickets straightaway when she didn't add Orlando to her list of "must play" cities. I'm very thankful my friend Genevieve tipped me off about a pre-sale, landing me in the second row to witness that goodness, too. It was a good two-and-a-half blessed hours of good, solid, craftsmanship. It was stepping back in time, when concerts used to be more substance than they were spectacle ... a big stage in an old theater with a couple of chairs and a couple of microphones and a couple of the most solid performers I've wrapped ears around ... David Rawlings never missing a note on that guitar and Gillian sounding better than I'd ever have expected she might (and that goes for the horse hooves clippity-clop sound she made with her hands and the unexpected off-to-the-side clogging, too). They dipped into their deep well of songs and I left wholly satisfied, having heard every song I'd have wanted to and some I was surprised by (I'm looking at you, Johnny Cash song of a show closer). I suppose the songs they gave us were sad, too, for they said the same ... Depression era styled music for a more modern day ... but I wasn't there to shed tears. I was filled with something else. In fact, I wore a grin so long on my face, I didn't know I was doing just that until my face started to hurt. Earning a couple of extra laugh lines to see one of your favorite musicians for the first time, though? Worth it. So worth it, a-thousand times over.